Here in England we have a tradition that at Christmas, ghost stories are told and read. 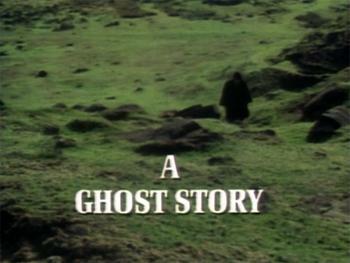 I think it dates from the Victorian era, for the Victorians liked a good ghost story, and made the transition to the television in the 70s with an excellent series of ghost stories by the BBC (including Charles Dickens’ The Signalman, pictured). M0re recently, BBC4 has revived the tradition with a mix of fresh adaptations (such as Whistle and I’ll Come to You) and new stories (Mark Gatiss‘ excellent Crooked House). I’m also partial to a ghost story or two, and as my friend Mark leant me an audio book featuring a variety of ghost stories I’ve been scaring myself into the Christmas spirit every night on the way home. So, what better way to mark the yuletide than with a post about running a traditional Victorian ghost story using Dead of Night? I posted part 1 of my actual play in the last post. 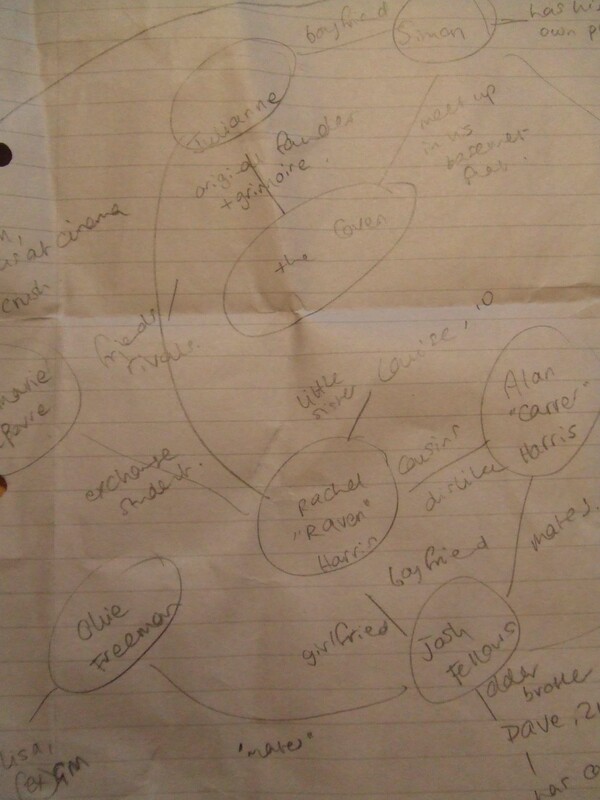 I set the scene before character creation – two nights ago your teenage coven summoned something it could not put down; last night Salford was swept by a wave of rioting and looting; tonight two of the coven haven’t shown up – so we kicked into the game straight away. The coven scrabbled around Simon’s flat, determining that yes, the grimoire was indeed gone, before breaking into his bedroom where they found it crawling with cockroaches and a strange, sentient blood-like ooze that Ann-Marie insisted on taking a sample of. They then fled the flat, where they ran into a group of rioters including the now-infamous Billy Hunt, who tried to bully Alan into holding the big tv he’d just nicked. This scene was great, as it set up Billy as a hard case, as well as putting Alan’s own bluster and bullish manner into perspective (Billy bullies Alan, so Alan bullies Ollie). Cops arrive, coven flees, only to find Simon’s body crucified in an alley, his phone filled with frantic voice mail messages from Julianne telling Simon she’s hiding out in the derelict flats.It’s about this time they first notice the car with blacked out windows and an Italian number plate following them. I mentioned the game of Dead of Night I ran at Furnace the other week, Salford’s Lot, in my last post, so thought I’d post a quick actual play about what happened as it was a great fun game. The premise of the scenario was a simple one – the victims were all teenage members of a coven, dabbling in things that they do not understand. Last night they summoned something they could not put down. Tonight two of the coven have not turned up and riots are sweeping the town. Go! One of the things I’ve wanted to try for a while is a game of Dead of Night where the victims are all monsters – or at least have access to Monstrous Specialisations (aka cool powers). I know Scott has tried this a few times, so I hope he’ll pop up in the comments to talk about his experiences, but I’ve only ever tried it a couple of times in the past, and never with the whole group. The idea I had was to run a game inspired by the Craft or the Covenant – you know the schtick, a group of teenagers mess around at playing witches, end up summoning something bad and getting into trouble. I wanted to run that game, with the players all as witches with supernatural powers, running from something worse. 7 Days of (Dead of) Night – Halloween sale! To celebrate the awesome zombie series, the Walking Dead returning to our screens, coupled with Halloween next week, PDF copies of my horror game, Dead of Night, are half price over at RPGNow for the next week – just $5 instead of the usual $10. Dead of Night is the roleplaying game of campfire tales, slasher movies and b-movie horror. It’s designed to be quick and easy to play, with rules that help you tell horror stories without getting in the way of the fun. The rules are simple and straightforward to learn, yet offer all the options and depth to allow you to customise the game however you like. Dead of Night is perfect for Halloween horror gaming – with character creation taking no more than 5 minutes and a host of advice and resources for running games on the fly, you can be playing in no time. And, if you’re really impatient to go, there are four ready-made scenarios in the book and downloadable PCs available on our website. Go on, give us a scream! Belatedly (I think I might have the dubious honour of being last) I’ve submitted my games for the excellent Sheffield rpg convention, Furnace, which is about 5 weeks away now. It’s all booked up already (and has been for months), so I’m afraid you can’t go even if you want to, but I thought I’d post the games all the same as they’re an insight into the goings on of my gaming world right now. So here they are, with added commentary. A GMless story game of intrigue and insanity at the end of the world, for 4 players. Andrew says: you know the drill with this one – it’s a GMless (kinda) game about outscheming all the other players, stealing all their memories and being the last survivor when the world falls apart. All kinds of fun so long as players go for the throat. Salford’s Shadowgate Estate on a friday night, 4 of your best mates, 2 litres of cheap cider and a grimoire full of spells. But tonight there’s trouble brewing – magic that you didn’t call up, monsters that you can’t put down and a real, bonafide witch hunter new in town and with something to prove. Magic – it’ll get you killed. Or worse, grounded. A horror game in the vein of the Craft, Salem’s Lot and the Covenant, for 5 players. Andrew says: I’ve wanted to do a Dead of Night scenario with all the players as witches and warlocks for a while now, but as is often the case (and Scott Dorward is like this too, I gather) it’s not until I get a pun-filled name that the brain cells really start rubbing together. Should be fun, in any case, although sunday morning isn’t my preferred horror slot. Earth is a distant glimmer in a sea of a thousand stars, and all you’ve got on this alien shore is the close-knit crew you call family and barely enough supplies to last the month. In the face of adversity, can you survive – and more importantly, can your friendships? A playtest of a game of family in crisis amongst the stars, in the vein of Firefly, Battlestar Galactica, Stargate Universe et al, for 4 players. This one’s new, and highly subject to change, but I’ve had a yearning to write a game that emulates all those close-knit family-esque sci-fi settings for a while now but – as is often the case – the particulars only unfolded on a recent long drive back from holiday. I’ll post the game itself up later this week. It was UK Games Expo last weekend, one of the UK’s newest and best games conventions, already up there with Furnace, Conception, Indiecon and Dragonmeet in my top 5 UK cons. I was there as part of the smallpress rpg booth, which this year comprised the Collective Endeavour and our Finnish friends, Arkenstone Publishing and we had a very good con, introducing all sorts of quirky games to all sorts of quirky gamers. I was meant to be running a new Dead of Night scenario, Djinn, but a lack of players saw it remain in my bag. So I thought I’d post about the premise here all the same. “Five friends, stuck in the middle of nowhere. A mysterious relic, a treasure lost to the ages. An ancient spirit, powerful and vengeful. Five wishes, one apiece, immeasurably powerful. What is your greatest regret/missed opportunity? What (or who) would you be prepared to sacrifice in order to save yourself/your way of life? What is the one thing that you never want others to find out about? The players then have a hand in authoring their characters, their wishes and new lives, and then me and the djinn get to come along to kick it all over. I was thinking about writing it up today and connections began to emerge with another unpublished scenario, Grendel, Alaska, not just with the close-knit community unravelling with the appearance of the monster, but also the mythological/legendary origins of the monster. I’ve got another scenario idea kicking around with a similar theme (something to do with sirens and temptation), and am pondering bundling all these modern updates of mythological monsters together as a little supplement. Would anyone be interested in such a thing?